In a world that is forever changing and the challenges that we will be facing in the years to come, Feed It Green believe that renewable energy and efficient ways for using technology will bring us closer to a brighter future for generation after generation. We care deeply about the work we do and the happiness of our customers and having a 100% satisfaction Guarantee gives peace of mind to all our customers. Feed It Green is focused on providing cost effective energy saving solutions and renewable energy systems. With our head office in Liverpool and offices in North Wales and Manchester we understand the importance of social responsibility and sustainability. We work closely with local companies and charities to provide the best possible solution for all stakeholders. Feed It Green know that the dependency on Fossil fuels needs to be addressed and providing carbon emission savings for all of our customers is our top priority thus being part of the Carbon Trust helps to promote this and customers can apply for government Grants to help cover the cost of their project. 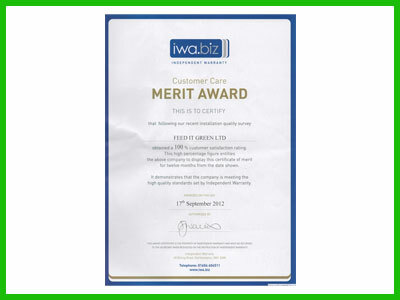 We have recently been awarded 100 % customer satisfaction from the Independent Warranty Association (IWA), after 100 Solar panel installations. 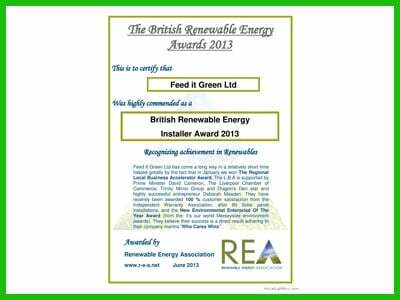 Feed It Green Ltd was Highly Commended for the Solar Panel Installer of the year Award and received this award for Recognition & Achievements in Renewables. 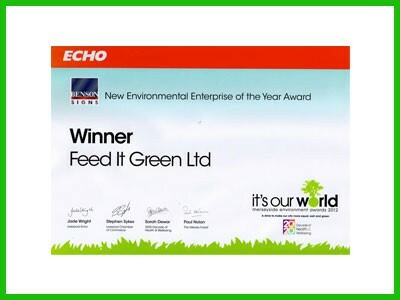 We also won the Liverpool Echo ‘It’s Our World’ Merseyside Environmental Award.